With foodborne-illness outbreaks occurring in many places across America including Illinois, food safety has become a pressing, continuing concern of public-health organizations and the state’s restaurant community. Restaurants and other food service establishments in the state are regularly inspected by the health department, to ensure that kitchen facilities are up to health standards and employees are complying with safe food handling practices. The Illinois Department of Public Health and the City of Chicago requires that all food service establishments which, prepare and serve food will be required to have a certified food service manager on the premises at all times food is being handled. CS Academy is offering the new 8-Hour Food Service Sanitation Certificate Course and Exam (All in 1-day). Upon successfully passing the online exam, You will receive your ServSafe Food Manager's Certificate (Same Day) and your City of Chicago Certificate. Cost includes: Instructional materials, exam, and ServSafe Food Manager's Certificate and the City of Chicago Food Sanitation Certificate. The exam for the Food Service Sanitation Manager Certification is administered immediately following the instructional training. Illinois Department of Public Health Certification (has been eliminated effective January 01, 2018) However, the Illinois Department of Public Health has mandated effective January 1, 2018, all Certified Food Managers complete training in Allergen. If you are a Licensed Daycare Home or Center in the Cook County Areas, you will need a City of Chicago Food Service Sanitation Manager Certificate. $288 Package includes: The material, mandated 8-hour course, an online exam, ServSafe Food Manager's Certificate (Same Day) and City of Chicago Food Manager Certificate. Course Time: 8:00 am to 4 pm. This is an 8-hour course, please be prepared to stay for the duration of the course! You MUST be on-time Examinees will not be permitted entrance if more than 5-minutes late) Lunch is not provided. Please wear comfortable clothing. Please bring your own laptop or iPad to take the online exam. ​2-in-1 for $288 with a Passing score of 75% will receive Servsafe Food Manager Sanitation Certificate (same day) and a City of Chicago Food Manager Certificate. 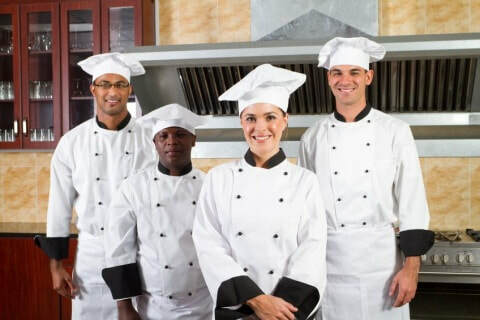 If your company or organization has 10 or more employees who need a Food Service Sanitation Manager Certificate, we will come to your facility, and host the new Same-Day, 8-hour Food Service Sanitation Manager Course, Exam, and ServSafe Food Manager's Certificates for $265 per person. We will waive our on-site facility fee of $125, as a discount. For more information please contact us at 773-778-0818. A Rep is available to assist you. Terms and Conditions are subject to change without notice. We reserve the right to refuse courses. We will notify users by posting any updates on this website or via email. Your continued use of this website shall constitute acceptance of such revised policy. Exam type will be ServSafe. The course only applies when payment has been made in full prior to the day of the class. If the student does not bring a valid government photo ID to class/exam or if the name on the ID does not match the name of the person registered, he/she will not be able to take the exam. Payments must be received and processed at least 1 business days prior to the scheduled class. Same day walk-in registry will be subject to the Walk-in Fee ($25). An individual can be refused service if payment has not been received prior to the scheduled class. In the event a class is full and there are students with a balance, they will be removed from the class for any new students who are willing to pay in full. Neither the exam results nor the certificate will be released until all balances and/or fees have been fully paid. There are no cancellations or refunds. One courtesy reschedule is offered within 2 days prior to the class/exam date. The rescheduled class must be taken within 45 days of the original class date. Any reschedule past the 45-day mark forfeits the registration fee. We also provide reasonable accommodations for applicants with disabilities covered by the Americans with Disabilities Act (ADA). If you have any special accommodation needs, please contact our office at least 3 days prior to your scheduled class/exam date. Payment must be completed prior to receiving any training materials or the scheduling of exam unless otherwise approved by the administrator. To schedule an appointment to take the exam, the student must call CS Academy or check our website within 2 business days prior to the desired exam for a re-schedule date. If the student does not bring a valid government photo ID to the testing center or if the name on the ID does not match the name of the person registered, he/she will not be able to take the exam and forfeits the cost of the exam. Test results and Certificate will be available for download within 48 hrs. upon passing the exam. There are no cancellations without notice. We are confident that you will pass the certification exam after attending one of our classes. If you do not pass the 1st time, we will pay for your seat to attend our next training class. Applies only for Foos Sanitation Program class registrations. The student must be registered and paid prior to exam date. The retest must be taken within 3 months of original exam date. The student must attend FULL class to qualify. Reschedule fee may apply if retest date is missed. Late admittance voids this guarantee. Subject to change without notice. Neither the results nor certificate will be released until all payment or fees have been paid. If you are not satisfied with the quality of our training, we will refund your money. You must notify us prior to taking the certification exam to qualify for this guarantee. Once the exam is administered, the money-back guarantee will no longer be valid. Valid only on full food sanitation class registrations. This guarantee may not apply to private class requests. Disclaimer of Warranties and Indemnities. CS Academy Food Safety Program does not provide any indemnities or warranties, either express or implied, as all content, materials, and services on this site are provided on an "as is" basis. CS Academy Food Sanitation Program will not be liable for any consequential, indirect, special, or punitive damages. In no event shall the maximum aggregate amount of any potential liability exceed the amount paid for the services provided.